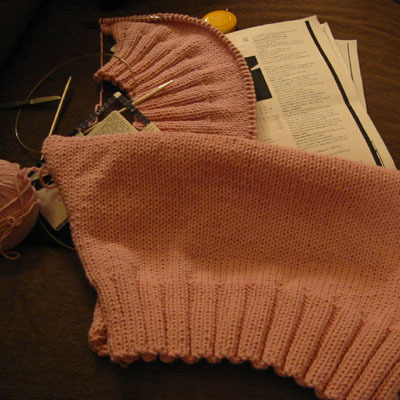 After frogging Cherry Mango, and then totally reworking my plans for this sweater, I'm making progress again. I had a long trip (for work and pleasure) last week, and had hoped to get a lot accomplished en route. I was thwarted by an expectation that I would work on the train ride down (can you imagine?) and then by a pounding headache (possibly the result of a the bachelorette party the night before) on the way home. I'm trying to make up for it now, and considering joining Alison's Holiday Gift-Along (see right column) to keep me motivated on this (and other) Christmas presents. I'm pretty sure that my tally would be similar to Dava's: 3 of "aaargh!" completed! Yeah, Cherry Mango's back and looking good! My sooty mango will be getting a big dose of cherry very soon. Ooh, mysterious hints... Let's cherry mango together on Sunday, 'kay?